Holly was born in 95 so she was pretty young in the 90’s but all my kids enjoyed watching “Teenage Mutant Ninja Turtles.” When we saw the fabric online at Michael Levine (www.Lowpricefabric.com) I knew I needed to buy some. I actually bought quite a bit- and made my grown son a button down shirt, which he wears all the time and gets SO MANY compliments on I thought I should go into TMNT shirt business! Holly’s dress is cute and simple and gets just as much attention as her Marvel dress and Pac Man dress. We went to a company picnic on Saturday and Holly wore her dress. It is my son’s company picnic and they put on a GREAT party. Olympic games, surfing, trampolines, jumpy castles, fantastic food and an “who can make the biggest splash” contest. Fun times and because we are his family we have attended three years in a row! I guess he will get married some day and then we will be nixed from the guest list but for now we all attend! This picture was taken in front of the house. A big gorgeous house! Ooops- I got side tracked. Because honestly, there is not much to say about the process of making this dress because I have made several! The bodice has been fitted and as long as she doesn’t eat too many pizzas I can just use the same pattern pieces I used the first time round! I do cheat a bit on the skirt. I just cut two pieces the width of the fabric and the length she requested and add pockets. 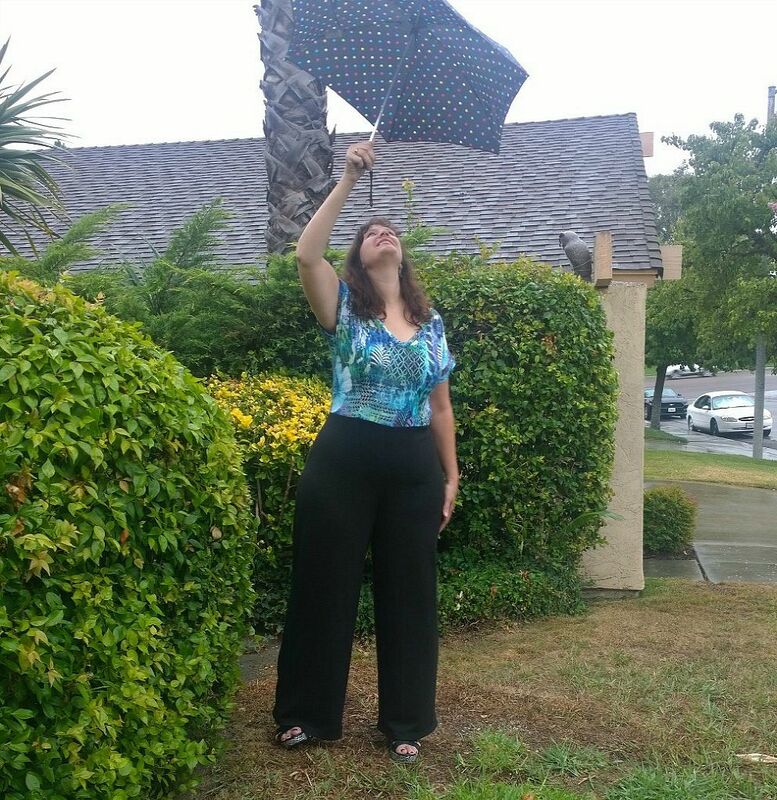 Ya gotta have pockets! Do you see the pizza slices on the dress? The Turtles were ALWAYS eating pizza! The back of the dress is pretty much self explanatory too. I used an 18″ zipper. A white one because I have over 50 zippers in my stash and if I have a zipper I can use, I am going to take from the stash first! And there you have it. 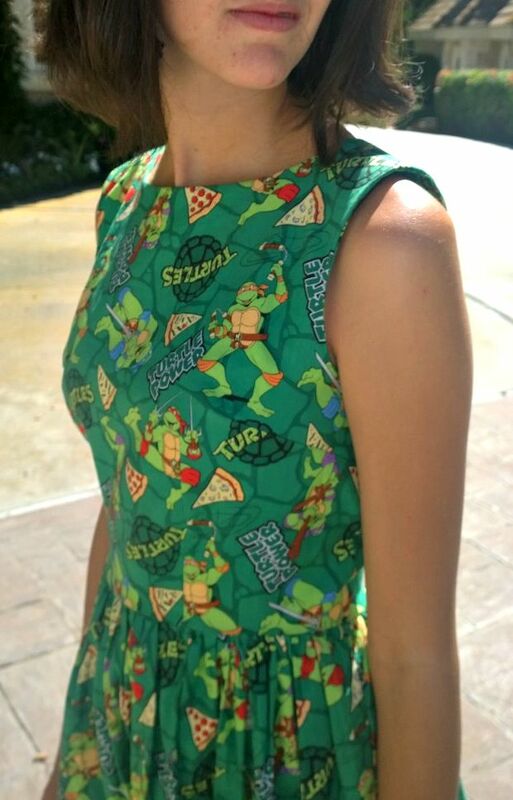 A Teenage Mutant Ninja Turtle dress worn by a college student! She has a line up right now- A Cowboy boot dress, a Dr. Who dress and a pair of flannel Dr. Who pajama bottoms. AND a cherry dress. I better get busy! Thankfully she wears her dresses all the time so I don’t mind adding to her wardrobe! For Mothers day this year D2- (middle daughter) got me a sewing basket. 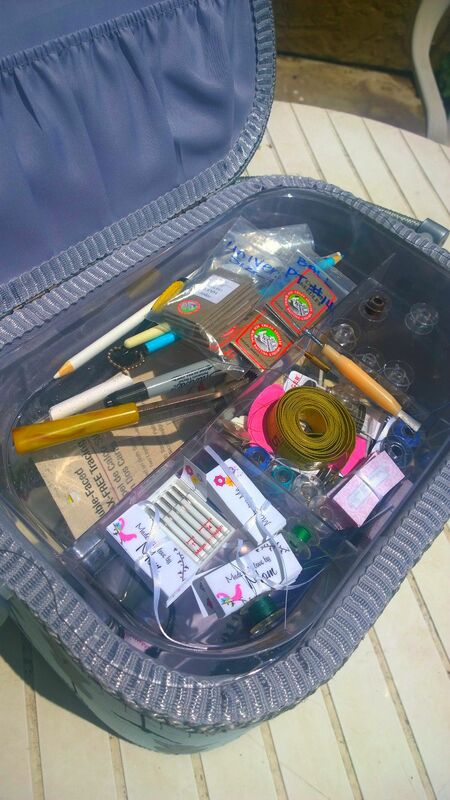 A PERFECT sewing basket. 🙂 One that made me smile since it has dress forms on it. I mean, what could be better than that?! I love my basket. I struggle with organization. I mean I LIKE to be organized, and try to stay organized but inevitably I allow a mess to build up in my sewing space and spend half my time LOOKING for things I know I just had. If I was able to spend my time SEWING instead of looking for the seam ripper or tape measure, well, I would have twice the wardrobe! To that end, I have been really good about keeping the basket right next to me on the floor, and replacing the items I use. And so far so good! 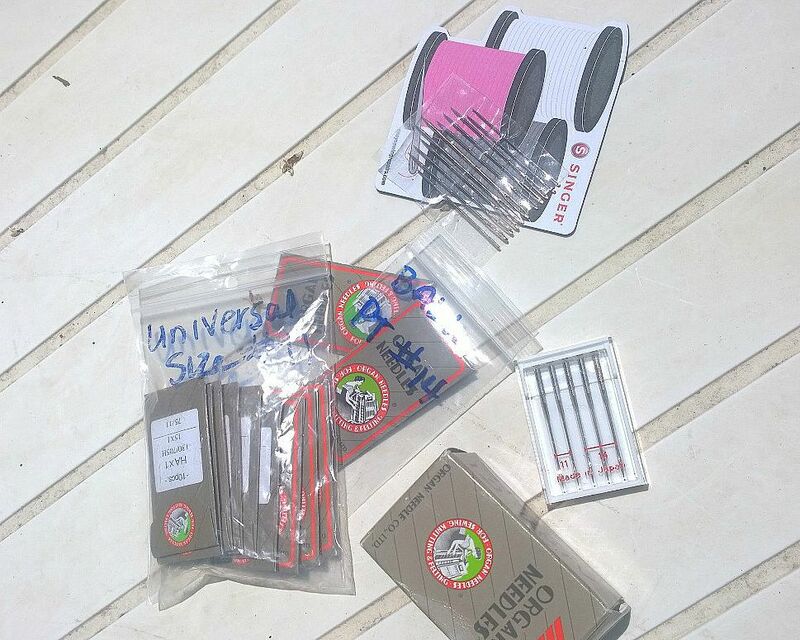 I have a thing for sewing needles. So I bought a “truckload” off Amazon last year. (Slight exaggeration) but you know what I mean right? There is nothing worse then buying a few needles at a time and then always having to hit JoAnns for more. I actually need to buy some more Ballpoint needles now BUT seriously, I have over 100 Size 12 sharpie needles. Im’a thinking they will last me a little while! I also have 14’s 11’s and some denim needles. Gotta keep myself stocked! And hand sewing needles? I cannot even express how many times I was almost finished with a project and could not find my packet of hand sewing needles. I’d be crawling around on the floor at 2 AM hoping I had dropped it and would stumble on it so I could finish my project. NOW, here they are in my trusty sewing basket! I have bobbins and tags. 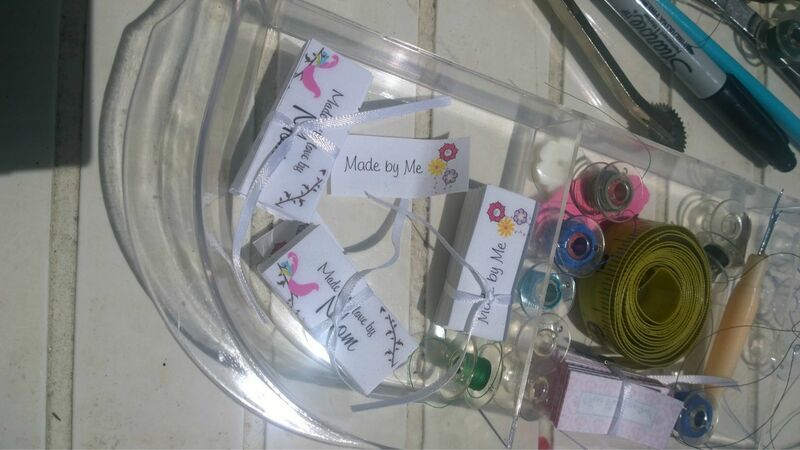 “Made by Me” and “Made by Mom.” 🙂 I like my tags. They make me happy! I also keep bobbins in my sewing machine compartment as well. The colors I use most often like black and white so I keep several ready to go. 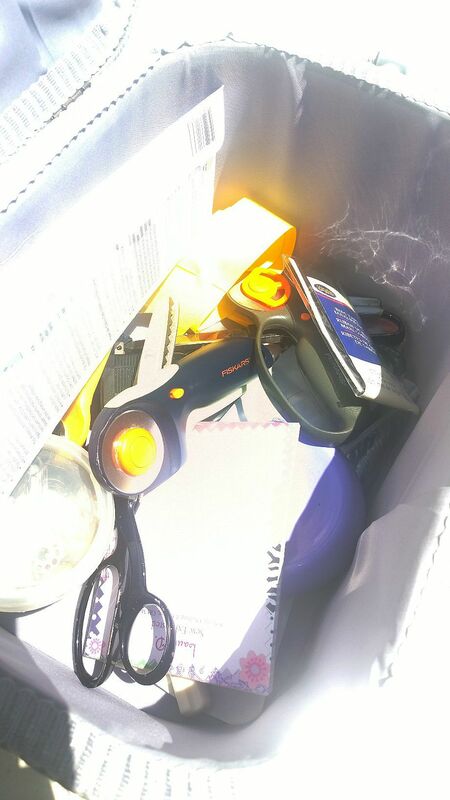 Not the best picture but in the bottom part I have scissors, my magnetic pin cushion, several rotary cutters and a few more random items. 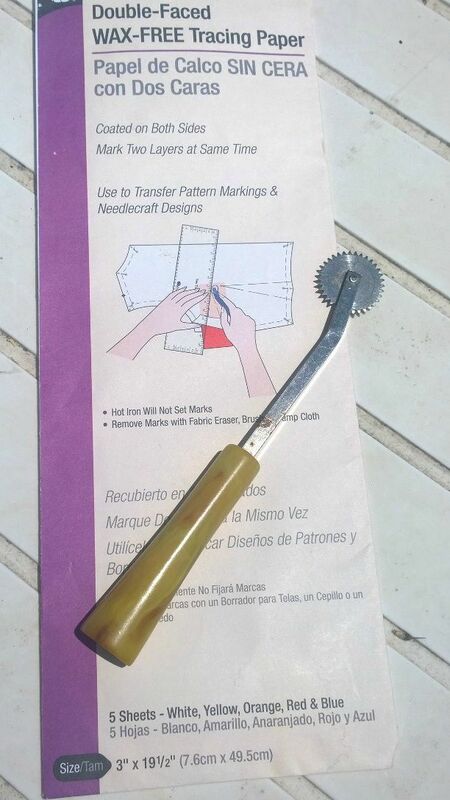 Like my tracing wheel and papers. 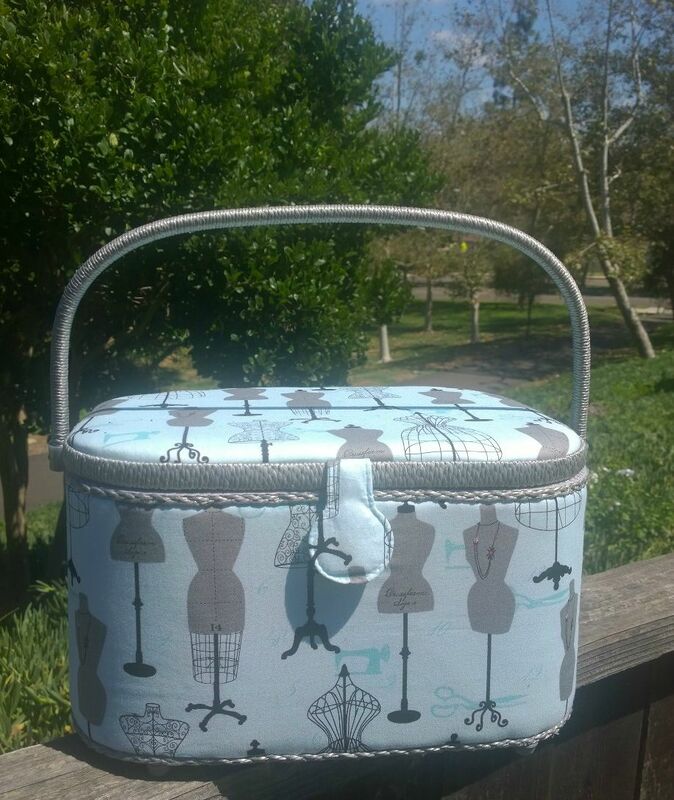 Life is much better when you have an organized sewing basket! I have also started my organization project on other parts of my space. 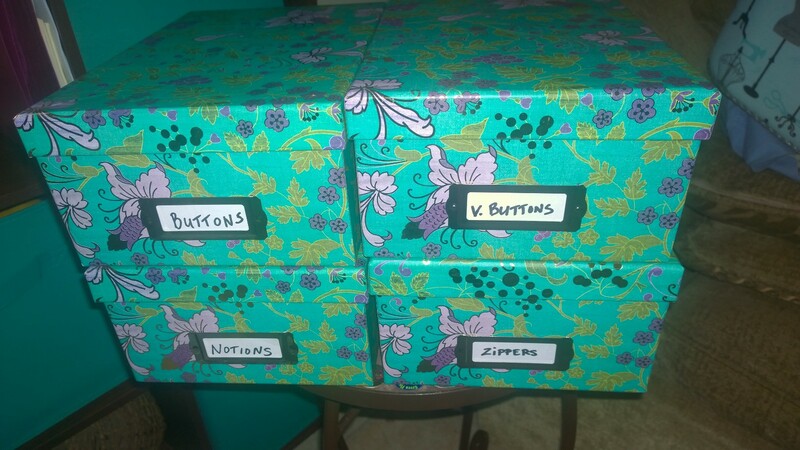 I am using the photo boxes from JoAnns to house “stuff.” Like buttons and zippers and notions like piping and lace. I love these because they stack nicely, and look good on my shelves! I am about ready to embark on organizing my fabric. I literally have about ** tubs of fabric. (I think like 11??!) I am debating on organizing by type- as in knits, cottons, challis etc… OR I have been thinking of organizing by colors! That way if I am working on a blue themed “capsule” I don’t have to dig through everything. I definitely think I want ALL my blacks together. Saves time digging through every time when I need something! I have to say some of the sewing rooms I have seen are so organized!! And I don’t know HOW you sewists who have to sew on the kitchen table do it! Do you pick up every night? On Aug 1st I am going to start a series. I have never had a series on anything but have had plenty of ideas. 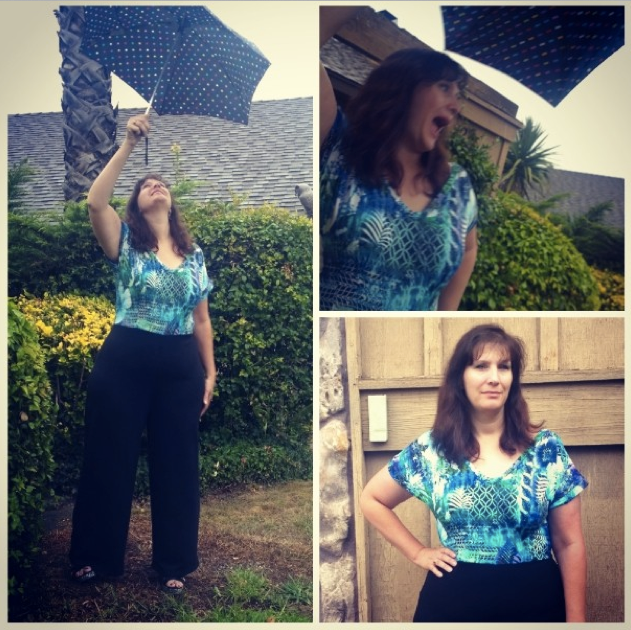 I like to challenge myself and so yesterday as I was looking at my “Free Patterns” Pinterest board I realized I had quite a few free patterns- and had NEVER made one. Not a single one! So, I have challenged myself to make one free pattern project a month. First up? 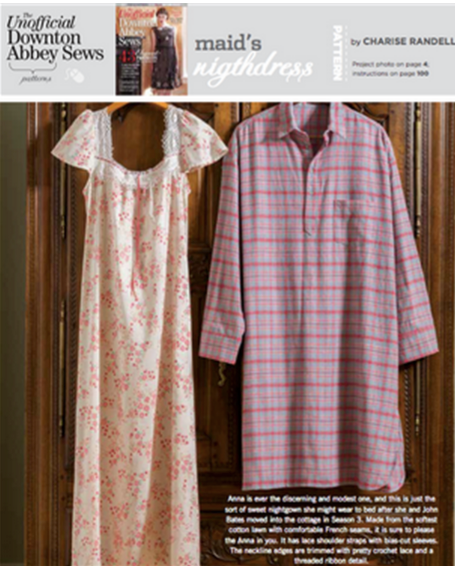 This sweet nightgown reminiscent of Downtown Abbey. I know it is the “maids nightdress” but seriously, I am pretty much the maid around here! Yes- I disappeared for a while. I have a tendency to do that and have been thinking a lot about why. And I think I have it figured out. 1. Picture taking- Most of my pictures are just plain crappy. I want a beautiful location and someone that will be patient enough to take several hundred pictures so I can throw most of them out looking for those few gems! 3. Picture taking- HEY- I see a pattern here. To take pictures you have to brush your hair and slap makeup on and make sure the lighting is good and you know what? That just takes time I rarely have. PLUS, you have to have someone available to take those pics. Sigh…. 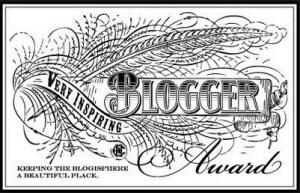 So, lets get to the reason I am here today- to blog about my Holly-Anna as I have dubbed it. I LOVE it. I LOVE it. I LOVE it. 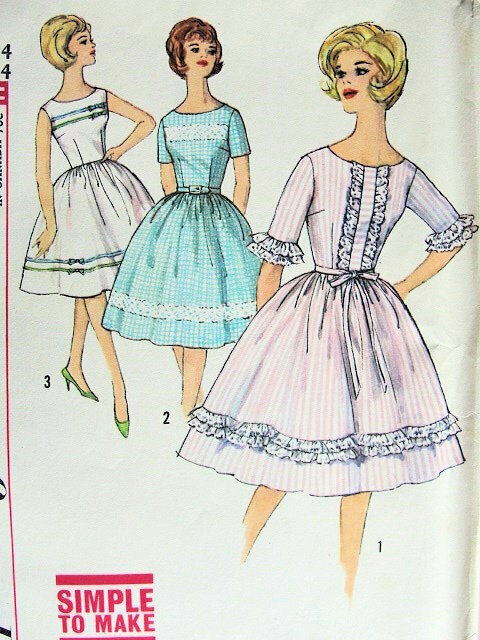 First off- I have made THREE By Hand London Anna Dresses. Because I can be somewhat of a lazy sewist I decided to avoid LOTS of fitting by using a knit for my first one. 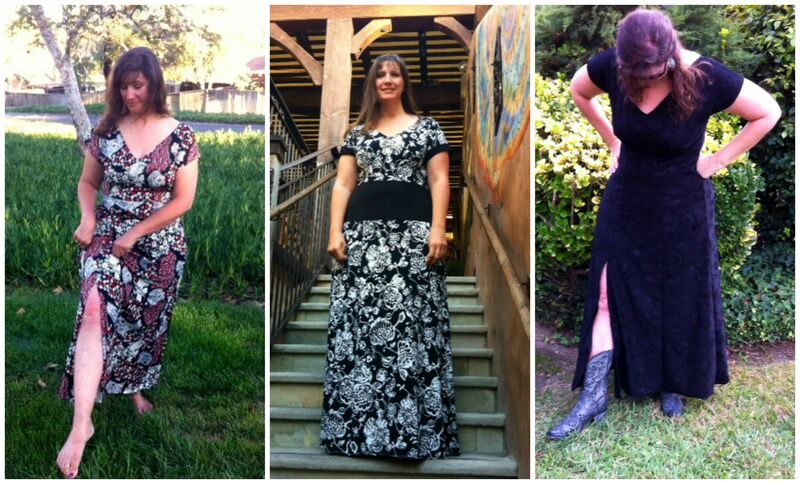 (You can read about it here) I loved it so much I made the Black and White Anna from knit for my class reunion and the all black Anna to wear with cowboy boots to a Country Fest. Knit all around- comfortable… easy to fit… and knit just works for me and my lifestyle. PLUS- size wise I have a little extra movement when using a knit so I appreciate that! When Laura Loves Pugs announced she was having an International Anna Party to celebrate her birthday I decided to join in. 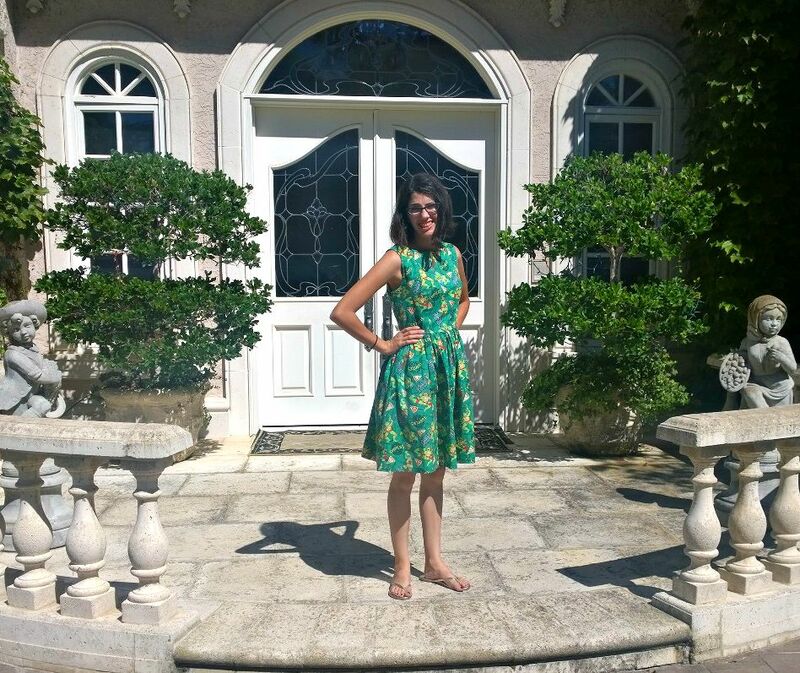 I LOVE the Anna dress and had been wanting a new one. As I was planning my dress I realized I wanted to do a Mash Up. I have never done one and it sounded intriguing. I have been wanting a jumpsuit so in a moment of genius (if I do say so myself) I grabbed my Holly jumpsuit pattern and traced the trouser portion. And boom- my Holly-Anna was born. Hey guys! 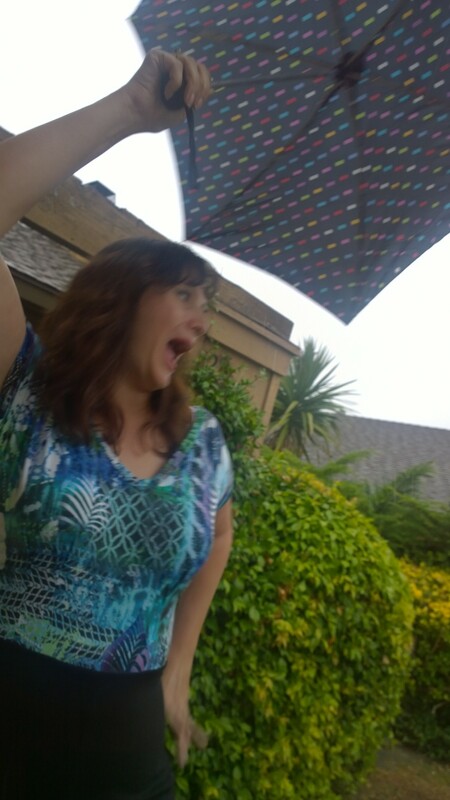 It is raining in California! Initially I was going to use a different fabric for the bodice. As a matter of fact I made the WHOLE thing with this pink fabric but as I was ruminating over the result ( I do a lot of “sewing thinking” as I try to fall asleep at night) I realized I really did not like to wear pink. 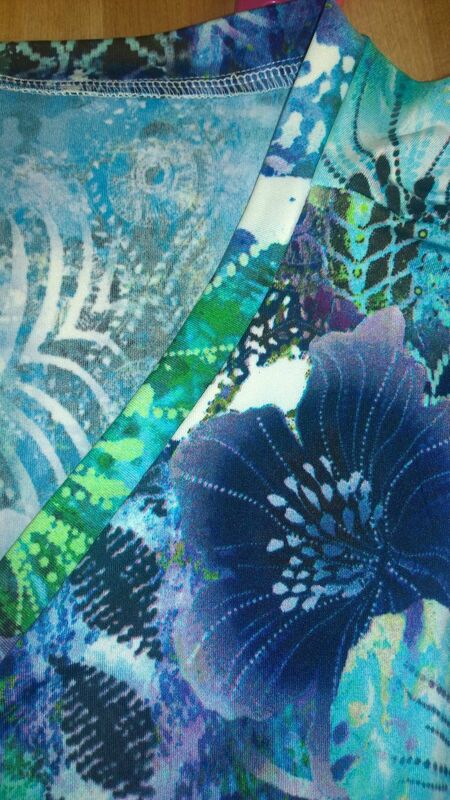 And I really did not like this fabric on me. See? Pink. Not me. 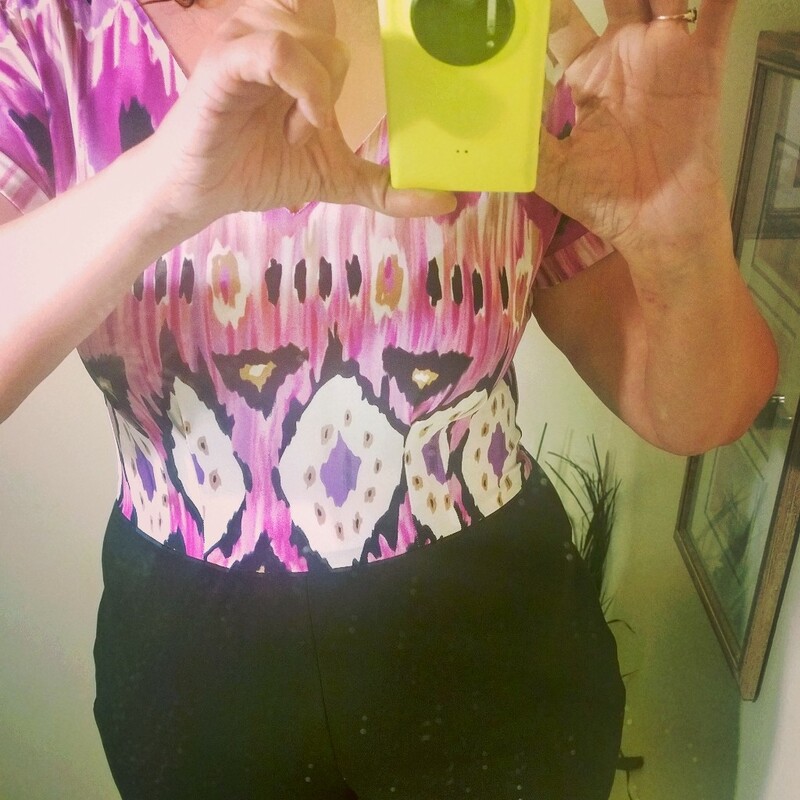 And I loved the look of the jumpsuit so much I needed to find a bodice fabric I would be happy with. I dug through every piece of fabric I owned unable to find something I wanted until on top of my washer I found my leftover Easter Dress fabric. What a happy result! This was not a difficult mash up. My bodice pieces had already been cut to accommodate using a knit so that part was done. I took my measurements (waist and hips) and traced the appropriate pant size. I also measured my thigh because unfortunately I am a “spoon” shape- small up top and a very round spoon bottom. (OK- pear shaped and VERY pear shaped!) I widened the trouser leg to fit my hip measurement. I used a ponte knit – a lighter weight Maggy London one I picked up at Fabric Mart (Oh how I love Fabric Mart!) and it worked well. I shortened my bodice a touch because I knew the weight of the bottom would pull it down a bit. You know what? It worked! For the bodice I used binding for the sleeves and the neckline because facings and trying to hem knits are not really my favorite things to do either. I think it looks quite nice and finished! Holly- Anna. I highly recommend it! 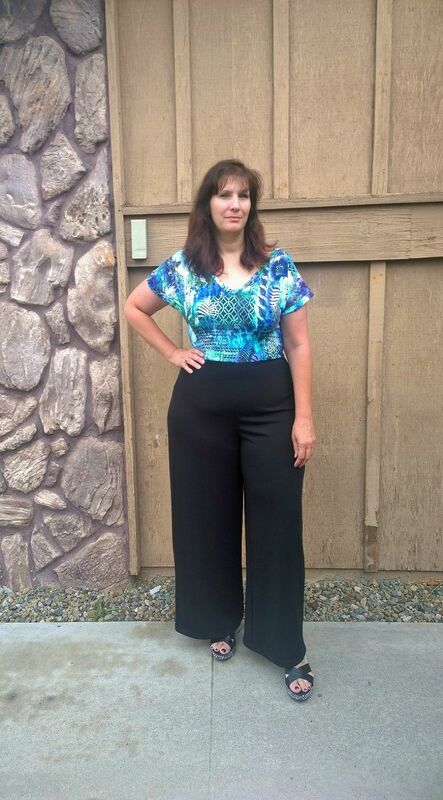 Quick and easy sew and jumpsuits are in right now! Maybe I will see you again soon? 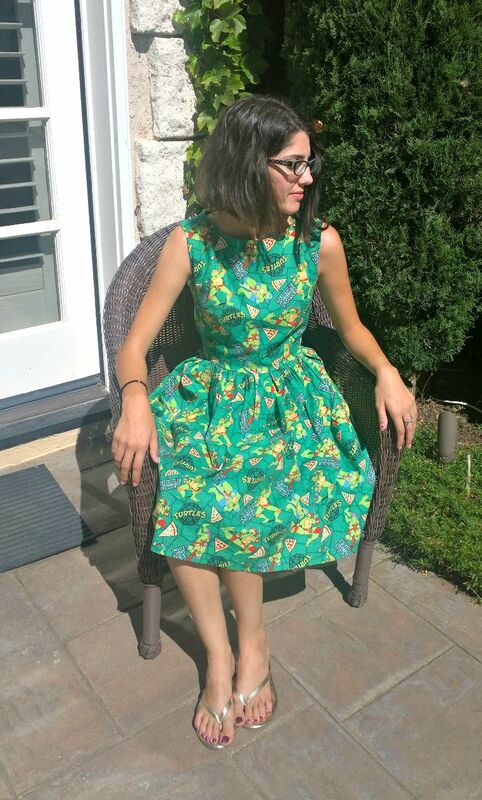 I made an adorable Star Wars dress for D1 and a Teenage Mutant Ninja Turtle dress for D2. Now if I could just rope them down for some pics!